Plus a Tots Bots Easy Fit Giveaway! Welcome to our our fourth issue of Cloth Diaper Column for 2013! This month, we're launching a little giveaway for our Pinterest fans, and we're talking about Cloth Diapers on Pinterest - my favorite social media site! Plus, we've got other news, new articles, and more! It's hard to believe May is almost over! Wow, time flies! I'm sorry for not getting a newsletter out last month, and I'm hoping you'll enjoy this one, plus an extra little giveaway for a Tots Bots Easy Fit this month - just because! "The bad news is that time flies. The good news is that you are the pilot." 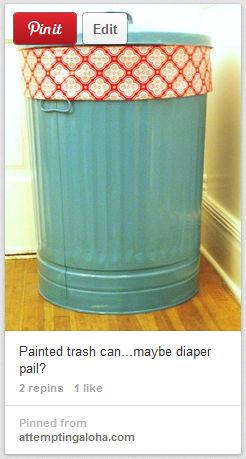 Pinterest is my favorite social media website. I love to browse websites and blogs, but I've always struggled to find the content I love later on. Well, no longer! Now I use Pinterest to organize my on-line inspiration! 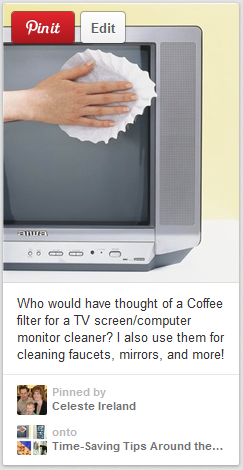 I'll warn you right now, as enjoyable as Pinterest can be, it's also a bit of a (mostly harmless!) addiction for me. If you've got something you need to do or somewhere you need to be, you may want to put your computer down now! For any of you who may not yet be on Pinterest, here's what Wikipedia says about it... Pinterest is a pinboard-style photo-sharing website that allows users to create and manage theme-based image collections such as events, interests, and hobbies. Users can browse other pinboards for images, 're-pin' images to their own pinboards, or 'like' photos. Unlike "bookmarks", Pinterest can easily be organized by theme, and provides a visual indication of what the page you saved is about, and you can add your own comments about the page as well. Below is an example of a pin I added to my cloth diaper board. You can click on the image below to view this pin on Pinterest. Plus, here's a link to my own cloth diaper board, which I've filled with lots of cloth diaper pins from Thinking About Cloth Diapers and other blogs and websites I read! This month, I'm offering a Pinterest-themed giveaway! I thought I'd offer a little bit of fun! 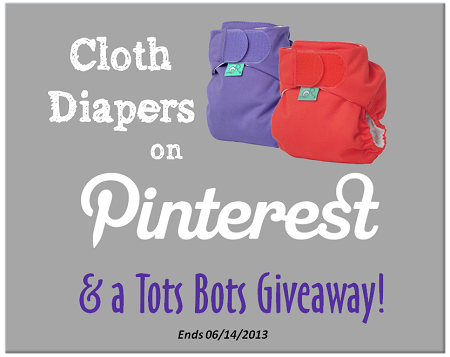 Follow us on Pinterest, or pin an article to your own boards, and then enter to win a fabulous Tots Bots Easy Fit all-in-one diaper! Good luck! Making Cloth Diaper Inserts - an overview of fabrics, plus links to tutorials and more! Our review of the SoftBums Echo plus a GIVEAWAY for their June Calendar Bum print... what do you think the new limited edition print will be? The latest in the BumGenius 4.0 Genius Series prints finally stocked in my local cloth diaper store, and I broke down and bought one that I've had my eye on for awhile! I love the beautiful gender-neutral Irwin print. You can find it and the new girly Mathaii in stock at Kissed by the Moon. Got your eye on a hard-to-find handmade fitted diaper? Watch our website for a special event launching June 18th - our second annual Made in Canada giveaway! I can't wait to share the list of our awesome sponsors with you, and you are going to LOVE the prize pack that I've rounded up with the help of some wonderful Canadian bloggers! If you run your own family-friendly business or know someone that does, it's not too late to participate in this event as a sponsor. Don't hesitate to contact me if you're interested in finding out more! We've got a few more giveaways coming up, so watch our Facebook page for announcements! The BumGenius 4.0 sale ends soon! They are running Buy 5, get 1 free (17% off!) until the end of May, and this is the best deal they offer on these popular diapers all year! Check out Diaper Safari for more details, but act soon, this deal ends on Friday! Like this? You can subscribe to our weekly cloth diaper sales round-up to get deals just like this one delivered to your in-box every week (just click on the weekly round-up link above and then fill out the sign-up form at bottom of the article). As a working parent, I know how busy life can get! Here's another pin I made that links to an article with tons of great cleaning tips and tricks for fast, easy solutions to common messy problems! Return to Cloth Diaper Column Back Issues & Sign-up.